We’d love your help. 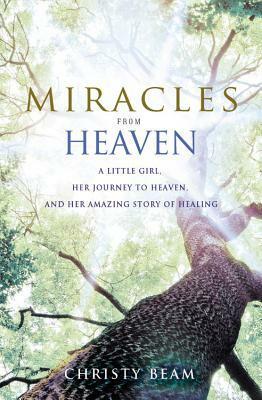 Let us know what’s wrong with this preview of Miracles from Heaven by Christy Wilson Beam. Annabel Beam spent most of her childhood in and out of hospitals with a rare and incurable digestive disorder that prevented her from ever living In a remarkable true story of faith and blessings, a mother tells of her sickly young daughter, how she survived a dangerous accident, her visit to Heaven and the inexplicable disappearance of the symptoms of her chronic disease. To ask other readers questions about Miracles from Heaven, please sign up. Mary Duncan This book does go from present to past quite often but is done in a clear manner. Not hard to follow at all. I really enjoyed it. Is this book for adults or children? Stephanie The book is for adults. This is a deeply spiritual book reflecting on God, Faith, and Miracles. If that is something that does not interest you, you may not want to try this one out. However, if you are Christian or have an open mind when it comes to faith based stories, this is a fascinating story. The book reads like a combination of the show Mystery Diagnosis and saving Jessica McClure from the well. If you do not remember Mystery Diagnosis, it was a show where someone would have an odd ailment that no one could figu This is a deeply spiritual book reflecting on God, Faith, and Miracles. If that is something that does not interest you, you may not want to try this one out. However, if you are Christian or have an open mind when it comes to faith based stories, this is a fascinating story. The book reads like a combination of the show Mystery Diagnosis and saving Jessica McClure from the well. If you do not remember Mystery Diagnosis, it was a show where someone would have an odd ailment that no one could figure out except one random specialist across the country who is the only one who knows anything about it because only 4 people in the world are affected. If you don’t remember Jessica McClure, in 1987, when she was 18 months old, she fell down a well in her backyard in Texas. It led to a rescue attempt that captivated the world for several days. Miracles from Heaven is the inspiring story of a chronically ill little girl whose condition was life-threatening but who found miraculous healing. I'm so grateful to have two relatively healthy kids. I honestly can't imagine the anxiety and heartbreak of having a child with chronic health problems. My husband's little cousin has a rare disease that isn't unlike Annabel's, and my heart breaks every time I see her mom posting on Facebook about another hospitalization or surgery. I can imagine the stress takes a toll on the entire family, and it requires some really strong parents and a strong child to endure for so long. I have so much respect for people in this situation, including the Beams. They did their utmost to make life as normal as possible, not only for Annabel, but also for their two healthy daughters, yet the reality is that their life was anything but normal. I greatly admire them all for their emotional strength and for holding up through a devastating situation with grace and dignity. Even during the parts of the book that really tug at the heartstrings, I felt calm, comforted by the presence of God, and wondered if this is how the author felt or how Annabel felt. Based on certain parts of the story, I would say probably not all the time (after all they're only human), yet somehow Ms. Beam managed to convey that sense of calm throughout. Then of course, came Annabel's miraculous recovery, which came about in a way that's truly stranger than fiction. As a writer of fiction, I can certainly attest to this, because the scenario is not something that I could have ever come up with in my wildest imaginings. After a particularly difficult bout with her illness that had left her emotionally wrung out, Annabel, who rarely felt up to playing outdoors with her sisters, went out to climb trees. They shinnied up an enormous Cottonwood tree they'd climbed many times before, but this time, the large branch where they liked to sit, started to crack. In an effort to get off the branch quickly, Annabel's sister told her to step inside a hole in the tree which they thought was some kind of depression. Never in a million years would anyone have imagined that the tree was completely hollowed out inside. Little Annabel ended up plummeting thirty feet, head-first to the base of the tree. She was stuck inside for several hours while rescue workers tried to figure out how to get her out. During part of that time, she appeared to be unconscious, and she says that she went to heaven where she talked to Jesus and sat on his lap. Jesus told her it wasn't her time, that he had plans for her and she must go back, but she would be totally fine. Not only did Annabel come out of her experience inside the tree almost entirely unscathed, but after that, the symptoms of her illness began to abate as well until she was completely healed. This of course, if the beauty of God's mysterious ways. We can't always make sense of them, but I can't help wondering if he sometimes does seemingly crazy things like this just to get our attention. One thing I really admired was how pragmatic the author and her husband, Kevin, were in their approach to Annabel's story of what happened inside the tree. They never pressured her for more details, simply letting her share what she felt like sharing when she felt like sharing it. They never tried to either dissuade or encourage her belief in what occurred. In fact, they themselves weren't entirely sure what to think initially. Soon they started to believe it, but still they were cautious in their optimism that Annabel was getting better. It took more than a year before they were ready to actually start using the word healed to describe what had happened. There are certainly those who expressed some degree of skepticism about what Annabel experienced inside the tree, but as Kevin told an atheist who questioned him about it, the one indisputable fact is that she not only survived a fall that should have left her with severe injuries if not killed her, but she's also now healed of a rare disease that has no cure. Readers can make of that what they choose, but I for one, believe something unexplainable and miraculous happened inside that tree and God had a hand in it. As a little afterthought here, I really like that Christy and Kevin have allowed that tree to stand, despite others encouraging Kevin to cut it down. It would have been a shame to destroy the place where such a beautiful spiritual experience like this occurred. Every time I pick up a faith-based book, I have a tendency to approach it with a certain degree of trepidation. Even though I am a woman of faith myself, I've read far too many of these types of books, whether fiction or non-fiction, that are preachy or seem to be pushing an agenda that the reader is expected to agree with. I'm thrilled to report that Miracles from Heaven is neither of those things. It's a truly inspiring and spiritually uplifting story that is very gentle in its approach. The writing style is highly engaging, keeping me riveted throughout. But IMHO, the true beauty of the book is that the author doesn't try to force-feed her daughter's story to the reader. She simply presents it as it happened and allows the reader the latitude to draw their own conclusions. Obviously, some will believe it (which I do), while others may not, but she doesn't seem overly concerned or perturbed by that knowledge. That, IMO, is true faith, which in turn is what makes this book so incredibly good and what makes it work. I think people from many different faith traditions could glean encouragement from its gentle message of hope and love. I thoroughly enjoyed reading it and thought that it was a stellar debut book. Ms. Beam certainly has a talent for writing, so I hope that she will consider writing more. Annabel sofre duma doença crónica que a impede de celebrar a Vida como qualquer criança normal. Um dos ramos cedeu e Annabel foi precipitada no interior oco da arvore, duma altura capaz de matar ou no mínimo paralisar qualquer ser humano. No entanto, Annabel sobreviveu ilesa e algum tempo depois desse acidente a sua incurável doença auto cura-se! Para quem não acredita num Deus Pai Todo Poderoso que se entretém a praticar milagres tal magico que tira coelhos duma cartola, explicar o racionalmente inexplicável é uma experiência algo desafiante! Annabel relatou que naquele tempo em que permaneceu no interior da arvore, falou com Jesus, que lhe terá comunicado que a sua Hora ainda não tinha chegado, pois o seu projecto de vida ainda não fôra concretizado. Bem...é certamente provável que a mente de Annabel, em modo inconsciente, por efeitos da queda, tenha sido palco de multiplos e variados sonhos! E...ao que parece, Annabel acreditou neles com "A"! Será que foi esse "Acreditar" a Magia responsável pela sua Cura repentina?! Have you met Annabel Beam yet? If you have not, then she has quite the experience to share with you. Annabel spent far too many days, more than a child should have to, in and out of hospitals. The reason? Annabel had a disorder, rare and incurable, that affected her digestive system and prevented living a normal life. Quite frankly, it was hell. Even though science had resolved to give her pills and dismiss her, that was not G-d's intent. Annabel had an accident one day when she was able to play Have you met Annabel Beam yet? If you have not, then she has quite the experience to share with you. Annabel spent far too many days, more than a child should have to, in and out of hospitals. The reason? Annabel had a disorder, rare and incurable, that affected her digestive system and prevented living a normal life. Quite frankly, it was hell. Even though science had resolved to give her pills and dismiss her, that was not G-d's intent. Annabel had an accident one day when she was able to play with her sisters: she fell three stories, headfirst, in a hollow tree. Surprisingly unharmed by the incident, she was touched and healed of her problems, after visiting heaven in her unconscious state. It is not my place to tell the rest of the story, however, and I will leave that to her mother, Christy Beam, who wrote this book. Instead, as a reviewer, I will allow you a glimpse to determine if this book is one you want to read (TL;DR - read the book). Who wouldn't want to read about a miracle? In fact, miracles have become a popular topic today, not only from Annabel's experience, but also that of the Burpo's (it was made into a movie, if that helps), and others. Miracles defy science, and in a world where every detail of space and the ocean is being mapped, the unknowable and unexplainable is quite attractive. That may be a great reason to read this book, and I am not one to disagree. Christy writes her tale of being a mother, and believer, with quite the voice. She eloquently tells the story of her daughter, Annabel, with strong references to the Bible. Her storytelling effects are quite impressive, in fact, taking a true tale and drafting it with such a creative stroke of the pen that it feels too much like a work of fiction - not out of unbelievability, but out of the prose she put on paper. Christy's voice is majestic in her retelling, realizing the bigger picture at hand, and G-d's handiwork in even the minute details. Readers will either love or hate the style of this book. Let me be quite honest with you. I am inspired by the book, and it reminds me of the greatness of HaShem, but it is not my style of reading. My wife, however, would eat it up, being whisked away from our living room and into the descriptive experience that Christy has created. A classificação não tem (quase) nada a ver com o facto de eu acreditar ou não em Deus mas sim com a escrita e a estrutura do livro que não funcionaram para mim. O livro alterna-se entre o passado e o presente, o antes sendo vários momentos desde o momento em que está doente, o momento do acidente, os tratamentos, o episódio do que viu, mais diagnósticos e tratamentos etc e o presente, os dias de hoje. Não há uma linha cronológica como por exemplo acontece na adaptação cinematográfica que estreia A classificação não tem (quase) nada a ver com o facto de eu acreditar ou não em Deus mas sim com a escrita e a estrutura do livro que não funcionaram para mim. O livro alterna-se entre o passado e o presente, o antes sendo vários momentos desde o momento em que está doente, o momento do acidente, os tratamentos, o episódio do que viu, mais diagnósticos e tratamentos etc e o presente, os dias de hoje. Não há uma linha cronológica como por exemplo acontece na adaptação cinematográfica que estreia amanhã (5 de Maio de 2016) com o título 'O nosso Milagre' em Portugal. A adaptação aí sim, já segue uma linha desde que se descobre que a Anna está doente até aos dias de hoje e aí é muito mais fácil entender como tudo aconteceu. O filme é muito melhor que o livro, até a convencer que tudo isto aconteceu. A diferenças são pouquíssimas. I was a very lucky goodreads first reads winner of this inspirational book. Christy Beam wrote this memoir of her remarkable little girl Annabel. For years their young daughter has been suffering with an incurable digestive disorder at nine years old she was on many medications, numerous surgeries, tons of doctors appointments. her illness meant being in pain always to the point where she once said "I just want to go to heaven so I can be with Jesus" Around Christmas time in 2011 her older siste I was a very lucky goodreads first reads winner of this inspirational book. Christy Beam wrote this memoir of her remarkable little girl Annabel. For years their young daughter has been suffering with an incurable digestive disorder at nine years old she was on many medications, numerous surgeries, tons of doctors appointments. her illness meant being in pain always to the point where she once said "I just want to go to heaven so I can be with Jesus" Around Christmas time in 2011 her older sister Abbie and Annabel went out to play during a moment when Anna was feeling a bit better. Climbing an old cottonwood tree.Annabel has a "freak accident" while climbing at least 30 feet high, Annabel falls into the tree and plunges 30 feet head first into the tree. Turns out the tree was hollow.thank goodness her sister Abbie was a witness and ran for help.Anna had fallen to the bottom inside the tree.It was hard to see her and know if she was okay. Six frantic hours later the firefighters were able to bring Annabel to the top.Thank God Annabel had somehow survived the fall. It was a couple days later when Annabel told her mother she had gone to heaven and saw Jesus. She was very descriptive of what she saw. There were more miracles the Beam family soon found out. Annabel was to show in the next few years. Miracles to her health they never thought they would see. This is a very nice heartfelt inspirational book. For those who love to read books that are religious and believe in Miracles, they will love this. I do not want to give too may details or spoilers. but this is a real heartwarming book. I sent this book on to a relative who needs to read about a miracle right now. I found this uplifting myself. Overall a good book, however I wasn't too keen on the fact that the storyline kept switching from Anna being sick, to falling down the tree, back to her being sick in the hospital, to after the fall, back to the tree etc. It made me very confused and it felt like I was missing pages. I was approached by this book’s publicist to read and review it (with absolutely no compensation or pressure for a good review), and while I was somewhat skeptical of another near-death testimony, especially that of a child, I have come to trust this publicist’s recommendations. Indeed, this book did not disappoint. Not only was it a compelling and dramatic story—told simply and without embellishment by the little girl’s mother—it was also spiritually uplifting in its testament to faith and hope I was approached by this book’s publicist to read and review it (with absolutely no compensation or pressure for a good review), and while I was somewhat skeptical of another near-death testimony, especially that of a child, I have come to trust this publicist’s recommendations. Indeed, this book did not disappoint. Not only was it a compelling and dramatic story—told simply and without embellishment by the little girl’s mother—it was also spiritually uplifting in its testament to faith and hope. The bare bones of the story began with the Beamer family’s middle child, Annabel, and her incurable, life-threatening digestive disorder that had them traveling to specialists and far-away treatment centers. It was breaking both their hearts and their pocketbooks, testing their faith along the way with heartache, discouragement, and despair. Annabel’s health issues had begun when she was only five. By age 9, in a hospital bed in Boston, she quietly and calmly whispered to her mother, “Mommy, I just want to die and go to Heaven and be with Jesus where there’s no pain.” As a mother, I was completely pulled into the story and the challenges this family faced. Annabel rallied from this low point and even had enough energy when she got home to be coaxed by her older sister to climb the old cottonwood tree in the yard, long a favorite activity of the children. They had done it hundreds of times without mishap. This time, however, alarmed by the cracking sound of the limb they were on, Annabel scrambled back towards the trunk, only to fall three stories, head first, into the hollow center of the tree. To have survived the fall without death, injury, or paralysis was the first miracle. Annabel said she was never alone in that dark hole. She visited Heaven and Jesus told her it was not her time to come home to Heaven. This experience was the second miracle. The third miracle was Annabel’s remarkable healing that occurred after she was rescued. At first I was annoyed by the chronological jumping back and forth from past to present, but in retrospect, it was an effective way to keep the momentum moving forward without ever getting too bogged down in the depressing details of Annabel’s medical history. I've read quite a few near-death-experience stories, and some were more plausible than others. In spite of my skepticism, this story rang true, and I found it both gripping and inspiring. I read this book while I was going through a difficult time and felt completely defeated. While reading it started to get my faith back and feel confident again that God has a plan for me even if the path there might be difficult. Thank you for sharing this story. It is truly one of God's miracles. Shawaizhoney I need urgently plz tell me the process. how can i read it? My rating does not have anything to do with the painful story and finding hope in God. Rather it was how this story was written, it was very cheesy with full of cliches that I heard all before. I should have watched the movie first, something that is rare for me to do. However I did not really feel empathetic to the characters, they were forgot about as soon as I turned the page. They just did not make any lasting impression on me. From the opening prologue to the page I stopped reading, it was My rating does not have anything to do with the painful story and finding hope in God. Rather it was how this story was written, it was very cheesy with full of cliches that I heard all before. I should have watched the movie first, something that is rare for me to do. However I did not really feel empathetic to the characters, they were forgot about as soon as I turned the page. They just did not make any lasting impression on me. From the opening prologue to the page I stopped reading, it was tedious. Nothing about the story was captivating, also the writing style was very elementary. I am sure that the movie probably could make this story come to life, sadly the book did not convey any emotion from me. It just read like a bad manuscript that failed to be edited, nothing about it made me continue to read how it ended. Please understand me that I am not suggesting that the subject matter of the story was boring, just HOW the story was told..BIG DIFFERENCE. Oh well it could have better with more characterization and consistency. Another book that bites the dust..
Heartwarming, Inspirational & Touching! An Amazing & Beautiful Read! I Loved It! Very inspirational book. After reading this book I totally believe that some children and adults actually die, go to heaven and then are sent back to do something extraordinary with their lives here on Earth. This book was amazing! I love it! It was so engrossing and inspiring! Everyone should read this book. Just one minor complaint that I have with many books is the jumping around in time and telling events out of order. I wanted to read this book since i am myself a girl that got sick with an illness that nobody really knew that what i was having or where it was coming from... sadly i was not miraculously healed as this lucky girl in this story. so now lets get into the book. There are so many parts of this book that i thing are very important to have in a book. It shares the struggles of a family that has a sick child/sibling. It shares both the side of the sick child as well as the side of the parents and the I wanted to read this book since i am myself a girl that got sick with an illness that nobody really knew that what i was having or where it was coming from... sadly i was not miraculously healed as this lucky girl in this story. It shares both the side of the sick child as well as the side of the parents and the healthy siblings. The struggles and hardships as well as the wonders and beautiful moments an illness can bring into a family. It shares the struggles of a chronic sick person that struggles to want to go on because pain is hard. And if nothing else, this book did that perfectly. It really shows that pain wears you down. If you are always in pain you learn to deal, you learn to survive, you learn to go on through the pain, pretend that its okay. BUT that is hard. Its work. And there are days its impossible. There are days where the pain takes over and its just so hard to pretend, so hard to play happy and were you just want to be over and yes, where you want to die. If you are in constant pain very SECOND of every DAY for YEARS? Dying isn't that scary anymore because at least one thing is pretty clear... that painful body you are currently trapped in? Thats no longer alive to feel that pain. No matter what age, if you are in pain, dead it something you think about. I have been in constant daily pain (and if you don't know what constant means, thats every freaking second of every day!) since i was 12 years old. I really liked that Beam shared the parts where her daughter told her that she was going to die and that that was okay. Because to/for me that little moment clearly showed me that this was really someone talking from experience of someone that lived with pain for a good while! I have read a good amount of book that share chronic pain/illness stories. And quiet a few of them say that they "always" suffered and than go on talking about all the things they did without problems or how they never understand how anyone can even think about wanting to die in their situation. And that is okay, but not realistic if you are actually someone that is/has been really sick. Pain is not something you "get over"! It wears you to the ground and strips you into nothing! That might sound dramatic, and might be something you don't understand at all. All i am saying is that the talk about wanting to die or being ready to die adds the realness and honesty to this book that i have not yet experience in many others and made me appreciate what this author did a lot more! So yes, this book really showcased the struggles of a painful illness and the effects it has in a real and honest and realistic way! And i loved that this is a true story of a sick child getting healthy. And sure its in a way that way to few people that are in similar situations in some form get to experience as well, but at least it shares a way that one person got better and that is something! Now i personally don't care if you call it god, religion or just misdiagnosis that was "scared" out of the body by a miracle survival after a fall that in itself should have been deadly. Call it was what you want. It clearly is a miracle that this girl not only survived but survived utterly healthy. And while this book does mention a lot of religion, god and jesus, its not an actual religious book! So if you are not religious but still interested in this book? It does not shove religion and their believe in your face, since that is not what this book is about! The way this book is written is not that great or at least it wasn't to me personally, for every specific reasons! We switch back and forth between the time the girl is sick and the time she is stuck in the tree as well as the time she is no longer sick. Which would be perfectly fine IF the Beam wouldn't constantly repeat things for no good reason at all. For example Beam talks about very early on in the book how she talked with her daughter how she experience heaven and states the answer of the girl, talking about the day looking back while we are in a section of the book that is in the "now", when the girl is healthy and survived. Between 20 to 40 pages later we get basically the exact conversation again, this time from the time right after it happened, so in a "sightly in the past" section of the book. But than around the same amount of pages later yet again, we get yet again. Sadly that does not happen just once or twice but way to often. Now do understand that this book is a non-fiction, its real life, its clearly emotional and hard times that this mother writes about. So i understand why some parts are repeated. Especially ones that are clearly important turning points or just general moments that are important for either the author herself or her family in general. BUT why is it necessary to share a specific moment that you want to share in "real time" later on in the book before it happens? Why can't we just get the past moments in the past section? I especially didn't understand it since a lot of the time in the "Past" sections it felt like the author wanted to share those bigger moments when something was happening as ... well i don't want to say a surprise but in a way that is exactly what it felt like. As something they all didn't see coming so she wanted to share it that way with the reader. Which again would be fine if the book would have been actually written in a way that made it possible to be surprised by those moments in the book. I would have loved to be surprised to read about the exact moment that the girl talked about her experience in the tree, for example. Or how they found out that she was completely healed in every way! You guys understand what i am trying to say, i hope. I think this book tells an important story. Miracles come in many different and completely unexplainable ways. And it is a beautiful story about a girl that clearly is much happier now and a mother that shares a lot of hard times and a huge amount of struggles very honestly and openly in a way that is very brave. So if you are interested in this book. An inspiring, true story regarding the extraordinary adventure of a child with a chronic disease... As she falls inside a huge tree, head down, everyone expects the worth regarding her condition. But miracles happen! I absolutely loved this book! I loved that it gave insight into a rare disorder and the tough journey that the whole family had to go through. The book was written in a way that makes it easy for the reader to understand and connect with the story. I devoured this story. Beyond inspirational, it was beautifully written, and just as a good memoir should--it read like a beautiful piece of literature. Thank you Christy Beam for sharing this story. I loved this story. It comes straight from the heart. An easy read that will make you reach for a tissue or two. Es un testimonio muy lindo sobre la misericordia de Dios. Es una historia que confirma que el sol sale para todos; y que Dios nos ama a todos . Existe ese sentimiento de que la forma en que se presenta la historia (pasado_presente) puede perder al lector ...me paso un par de veces. El otro elemento es que evidentemente esta es una familia baustista del sur de Texas ; con costumbres bien enraizadas; su círculo de amigos realmente es muy fuerte entre los miembros de la Iglesia y se hacen presente c Es un testimonio muy lindo sobre la misericordia de Dios. Es una historia que confirma que el sol sale para todos; y que Dios nos ama a todos . Existe ese sentimiento de que la forma en que se presenta la historia (pasado_presente) puede perder al lector ...me paso un par de veces. This was a very hard book for me to read. I saw the movie when it first came out in the theaters. A few short weeks later, I took my oldest daughter to see it. Two weeks after seeing this movie, we were living out our own "Miracles From Heaven" as my daughter had to be life-flighted to Children's Hospital for emergency brain surgery. It was only just a few weeks ago that I was able to watch the movie again -- and then read the book. The parallels between the Beam's story and ours was so striking.. This was a very hard book for me to read. It was only just a few weeks ago that I was able to watch the movie again -- and then read the book. The parallels between the Beam's story and ours was so striking....I often found myself underlining parts of the book that hit on exactly what I was feeling during our daughter's cancer journey. I loved every word of this book. My only complaint was how it jumped around a lot. I had kind of expected it to start at the beginning -- with Anna's illness. But that story was mixed in with her story of falling into the tree and then to her telling about Heaven, then back to her illness. Para começar o mês de Dezembro, decidi enveredar por este livro gentilmente cedido pela Editorial Presença para leitura e opinião ao blogue. Queria ler algo leve, mas que ao mesmo tempo alcançasse o meu coração, e foi exactamente isso que encontrei. Milagres do Céu é uma história verídica contada por Christy Beam, a mãe de Annabel, uma menina de 9 anos com uma doença rara e fatal do aparelho digestivo. Não leio com muita frequência este tipo de livros, no entanto, a verdade é que consigo tirar o Para começar o mês de Dezembro, decidi enveredar por este livro gentilmente cedido pela Editorial Presença para leitura e opinião ao blogue. Queria ler algo leve, mas que ao mesmo tempo alcançasse o meu coração, e foi exactamente isso que encontrei. Milagres do Céu é uma história verídica contada por Christy Beam, a mãe de Annabel, uma menina de 9 anos com uma doença rara e fatal do aparelho digestivo. Não leio com muita frequência este tipo de livros, no entanto, a verdade é que consigo tirar o chapéu a Christy Beam, porque de facto é uma história que merecia ser contada. No entanto, creio que não será uma leitura adequada para todas as pessoas. Uma das temáticas mais abordadas ao longo da obra é a fé e o acreditar em Deus e Jesus. E, a verdade, é que nos dias de hoje, nem todas as pessoas acreditam. No entanto, isso não quer dizer que não possam gostar da história, penso que pode é não ser exactamente esta a leitura que procuram. Apesar disto, é sem dúvida uma história bonita a ler principalmente nesta época – o Natal! É um livro pequeno, com 184 páginas, de leitura rápida e fácil e, como tal, não quero relatar aqui tudo o que acontece. Posso apenas dizer que estamos perante o relato de uma mãe, com sentimentos como o amor, a tristeza, a frustração, e finalmente a fé – a fé de que os milagres existem e que merecem ser contados. É verdade que a vida de cada um de nós pode por vezes estar repleta de obstáculos, desilusões e sofrimentos, mas se há algo que este livro nos ensina é que não estamos sozinhos. E foi ao longo deste que marquei pela primeira vez uma página com um postit, pois encontrei uma descrição que ainda não tinha encontrado em nenhum livro. É muito difícil estar triste e num beco sem saída, mas também é muito difícil para quem está do lado de fora vê-lo e até lidar com isso. Assim, deixo aqui este excerto que de certa forma tocou o meu coração. Pouco mais posso dizer :), apenas que talvez os milagres existam, como existiram para Christy Beam! The hardest thing for any parent is watching your child suffer and knowing there isn't anything you can do to help. That is the life that Christy and Kevin Beam witnessed for years as their daughter Annabel was diagnosed with a devastating digestive disease for which there is no cure, and would likely claim her life in the very near future. So for them, they never knew when Annabel's final day would come, so they did what most parents would do, is to try and make the remainder of those days the The hardest thing for any parent is watching your child suffer and knowing there isn't anything you can do to help. That is the life that Christy and Kevin Beam witnessed for years as their daughter Annabel was diagnosed with a devastating digestive disease for which there is no cure, and would likely claim her life in the very near future. So for them, they never knew when Annabel's final day would come, so they did what most parents would do, is to try and make the remainder of those days the very best they could be. Annabel's faith in God was always strong, despite the many tests, trials, medications, surgeries and lengthy hospitals stays she had to endure, she remained as strong as any child could. She held on to her faith in God. Being the middle daughter, her life was challenging at best. Sitting back watching others enjoy food was a luxury Annabel couldn't afford. Just taking a bite of food could set her in the hospital for obstructions in her intestines, and as you know, people celebrate life with food as part of life. How hard for a child to watch people open their stockings filled with candy and have to hand it over to others to enjoy. But the Beams would never know how a seemingly innocent day turned into a nightmare and would forever change the outcome for Annabel's life. An aging cottonwood tree on their property with a gaping hope thirty feet up in the air would trap Annabel as she fell head first into the black hole while her sisters watched in horror. Had they not been present, who knows if anyone would have found her. Annabel's claims that during the time she remained trapped into the darkness of the tree, she went to Heaven where Jesus assured her, it was not her time to come home despite her many pleas to her parents to "let me got to Heaven with Jesus where there is no pain." What follows can only be a series of miracles for the lives of the people who were a part of this life changing rescue. I won a free copy of this book through one of Goodreads' First Reads giveaways. This is the first non-fiction book I read, and I really enjoyed it. I have nothing but good things to say about this book. The story is beautifully crafted. I especially enjoyed the back and forth between the events when Annabel is caught in the tree and her struggles with her health condition prior to those events. Although the story was heart-wrenching at times, it was mostly full of hope and joy found in the little b I won a free copy of this book through one of Goodreads' First Reads giveaways. Although the story was heart-wrenching at times, it was mostly full of hope and joy found in the little blessings of the everyday: the love and support of family and friends, the small wins, the comfort found in faith. I appreciated that the main focus of the story was on those little miracles. It made the book very uplifting. I also think Christy Beam made an amazing job of telling the story of her family without it being preachy. It was simply a sweet tale full of faith and hope. Flipping the last page of this book will leave your heart filled with joy and comfort. What would you think if your child claimed to have sat in Jesus' lap? This poor girl had an illness that the doctors had a hard time figuring out. It caused a chronic bowel obstruction so she was very uncomfortable when she ate. With a large number of medications she was able to have an occasionally normal day. On one of these normal days she and her sister climbed a tree. When they tried to get back down a branch broke and this poor little Anna fell through the hole created. It took her family What would you think if your child claimed to have sat in Jesus' lap? This poor girl had an illness that the doctors had a hard time figuring out. It caused a chronic bowel obstruction so she was very uncomfortable when she ate. With a large number of medications she was able to have an occasionally normal day. On one of these normal days she and her sister climbed a tree. When they tried to get back down a branch broke and this poor little Anna fell through the hole created. It took her family and 3 fire department crews to eschew her. She came out talking about being on Jesus' lap and guided out by an Angel. Jesus said she had to go back to earth but she would be fine and Jesus has a plan for her.